The farmhouse at Bradleigh in 2008. All today’s Gorwyns and Lambert-Gorwyns not descended from the Georges of Spreyton can trace their ancestry back to a John Gorwyn who was born probably in 1691 and who moved to Bradleigh after his marriage (see Chapter 5 and TABLE 7). He was probably the brother of the Richard Gorwyn who inherited Lambert and became the ancestor of the Georges (see TABLE 1). So the two branches split from each other some 300 years ago. John owned and lived at the other main family farm, Bradleigh in the parish of Crediton, and I am calling his descendants the Bradleigh branch. We know almost nothing about this first ancestor of the Bradleigh branch. In 1717, he married Joan Morrice (from another old Cheriton Bishop yeoman family). At the time of the marriage to Joan, both of them were living in Cheriton Bishop. But by the time that their eldest son was born in 1720, although he was baptised in Cheriton Bishop, his father was described in the register as ‘John Gorwyn of Crediton’, so it seems likely that John’s father gave him Bradleigh when he married. Although Bradleigh is in the parish of Crediton, the church at Cheriton Bishop is within easier reach, and many inhabitants of Bradleigh seem to have treated it as their parish church. Only one of John and Joan’s three children seems to have survived beyond infancy, a son also called John Gorwyn (1720-1778) who inherited Bradleigh. His wife was called Elizabeth, her maiden name probably being Cockram, again from a well-known local yeoman family. John and Elizabeth lived all their lives at Bradleigh and after John’s death Elizabeth received an annuity from the estate, arranged no doubt as part of her marriage settlement. John also continued to rent the small farm of Spirelake in Cheriton Bishop from the Fulford family – the leasehold of which had been in the Gorwyn family from at least the mid-1600s. 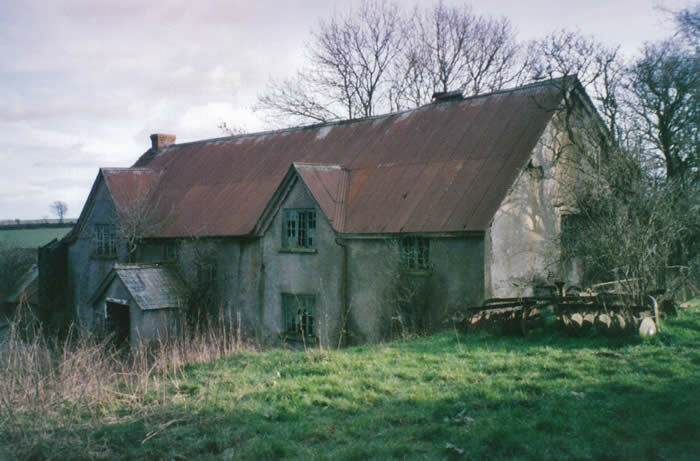 He purchased the freehold from the Fulfords (the local big landowners) in 17681 and the farm remained in the family until the death of Arthur Lambert-Gorwyn of Coxland in 1952. John and his wife Elizabeth had four sons, all of whom became more or less successful farmers in the parishes of Crediton or Cheriton Bishop. In the mid-1700s, John began calling himself “John Gorwyn alias Lambert” (or occasionally “John Lambert alias Gorwyn”). It is not clear why he did so, as he appears never to have had any direct connection with the farm of that name. It was, however, at the time that his uncle Richard Gorwyn recovered possession of Lambert and also began using the name, so perhaps he also decided to do so because of Lambert’s manorial status and the fact that it had been an ancestral home of both branches of the family for over 150 years. Perhaps because the connection with Lambert was somewhat tenuous, John’s children do not seem to have bothered with the name Lambert, mostly calling themselves plain “Gorwyn”. It was only in the following generation of the Bradleigh Gorwyns that Lambert began to be used again. After the death of John Gorwyn alias Lambert in 1778, Bradleigh descended to his eldest son John Gorwyn (1748-1812). He married Mary Lambert Gorwyn from the other branch of the family, the only recorded marriage between the two branches. After his death, Bradleigh passed it on to his only son, yet another John Gorwyn (1782-1824). These two Johns were definitely considered as gentry, and clearly pretty well off. In those days, banks were few and far between and not much trusted. Those with funds would earn extra income by lending money at interest, secured on property owned by the borrower, and it seems that both Johns used their money in this way. The younger John also appears to have had his own wider property interests, as a deed in the Devon Record Office reveals that in 1809 he and two partners were renting new houses in Exeter. He also purchased various other properties in the neighbourhood of Bradleigh and was probably farming several hundred acres. He performed the standard civic duties of a person of his station in the parish of Crediton. But both he and his father appear to have regarded Cheriton Bishop as their home parish, and both are buried there. The younger John never married and seems to have suffered some sort of nervous collapse in about 1812, never wholly recovering. He died intestate in 1824, with his affairs in some disarray, according to papers that have survived in the Devon Record Office and the National Archives2. By the laws of primogeniture, Bradleigh then passed to his cousin William Lambert Gorwyn – see below. Bradleigh was clearly by far the biggest farm in the hands of the family, and the other sons of John and Elizabeth do not appear to have fared so well as regards property, suffering no doubt from the determination to give the eldest son a worthy inheritance. Nevertheless, they were all able to buy or rent their own farms. William Gorwyn (1749-1817), the second son (ancestor of the Hittisleigh and Coxland Lambert Gorwyns as well as of the William Lambert Gorwyn who later inherited Bradleigh - see TABLE 8), got Spirelake. He was by far the most successful of the younger sons. Even though Spirelake (at some 60-70 acres) was a much smaller farm than Bradleigh, he either inherited enough money or did well enough to rent or purchase three other small neighbouring farms. When he died in 1817, he was able to leave not just freehold properties to his children but substantial cash legacies as well3. The two younger sons, George Gorwyn (c.1758-1825) and Joseph Gorwyn (1764-1832), both had to make do with leasing smallish farms in Cheriton Bishop or nearby. George’s will survives4; he is described in it as a yeoman rather than a gentleman, showing the ease with which a younger son of a gentleman could slide a notch down the social ladder. George appears to have left no male descendants. There are a couple of interesting references in the records to Joseph and his daughter Mary. At the time of the French revolution, there was a great patriotic surge in favour of the monarchy, and Joseph was one of those who joined it. Venn’s History of Crediton5 records how in 1792 “Gorwyn of Cole Ford” (almost certainly Joseph) was one of the farmers who rode into Crediton to join the townsfolk at the Ship Inn to form the Crediton Association and to pledge themselves to use their utmost endeavours to suppress seditious literature and to obtain subscriptions for the forces fighting the enemy. Joseph’s daughter Mary married a locally famous man, Abram Cann of Clannaborough near Crediton. He was immensely strong and was the champion wrestler of Devon. He won the title of champion of England in 1827 (the entries in the parish register recording the birth of his children refer to him proudly as “the celebrated wrestler”). Wrestling was a favourite sport among Devon working men. Abram’s father Robert Cann, who lived near Crediton, was said to be deeply involved in another well-known if less respectable Devon occupation: rum-running or smuggling. Crediton could be reached from the sea in a few hours by cross-country lanes, and goods (including items such as tea) were brought in by pack-horse under bales of hay. Robert’s wife Mary did the peddling with bottles and packets concealed in her market panniers and voluminous clothing6. Joseph had only one son, called William, who became a maltster in Exeter. He disappears from the Devon census records, and it is possible that he left Devon or even emigrated, although he may just have died young. The life of the smaller yeoman farmer could be pretty tough, particularly during the agricultural depression of the early 19th century. The fact that a son inherited a farm and thus a theoretical livelihood did not necessarily make him a good farmer, and probably at that period only good farmers survived. The farms were isolated, with little social life, and unhappiness and ill-health could take a terrible toll. It is perhaps symptomatic of what were difficult times that the only surviving son of Joseph and George should have left farming for trade. The fourth John Gorwyn to inherit Bradleigh left no descendants, so when he died in 1824 the property came to his cousin William Gorwyn (1780-1845), the William who had inherited Spirelake from his father. Thus Bradleigh passed from a dynasty of John Gorwyns to a dynasty of William Gorwyns (see Table 7). This first William Gorwyn of Bradleigh married Ann Blanchford of another local family of yeoman farmers. They had 11 children, eight daughters and three sons, 10 of whom survived to adulthood. Bradleigh had a large farmhouse, but it still must have been quite a squeeze to fit them all in. William seems at some point to have decided to start using the name Lambert again. When he was buried in Cheriton Bishop in 1845, he was described as William Lambert Gorwyn; and both his surviving sons (as well as his illegitimate grandson) called themselves Lambert Gorwyn. It is not clear why the Bradleigh branch resumed the name Lambert. By the 1820s, one member of the other branch of the family, George Lambert Gorwyn of Spreyton, was a very considerable landowner indeed, and it may be that the family wanted to stress their relationship with him. William’s eldest son William Lambert Gorwyn (1817-c.1880) inherited Bradleigh on his father’s death. In the 1851 census, he is described as a farmer of 387 acres, employing 6 labourers, and there were also two house servants, so Bradleigh was at that stage a large and prosperous concern. The Return of the Owners of Land done in 1873 records him as owning 771 acres. His only son, the third William Lambert Gorwyn of Bradleigh (1850-1928), for some reason seems to have done less well and by 1881 had moved to a smaller farm7. This last William had only one daughter (who married her cousin William Gorwyn Lee and has descendants). It is not clear what happened to Bradleigh, but around the turn of the 19th and 20th centuries it appears to have passed out of the family, bringing to an end an association of over 400 years. After the Second World War, however, the farm was purchased by a local farmer called Leslie Pitts, whose mother was a Lambert Gorwyn from the Hittisleigh family, and his descendants own it still. The first William Gorwyn (1780-1845) to own Bradleigh had an unmarried daughter called Mary (see Table 7) who produced an illegitimate child called Henry Lambert Gorwyn (1835-1905). According to the parish register, his father was George Webber of Trenna, a small farm in Hittisleigh being farmed by his father. Mary was about 23 at the time of the birth and George Webber a few years younger. He was unmarried and it is not clear why the couple did not marry, especially as George Webber remained unmarried until the 1850s. Although Trenna was little more than a (probably rented) smallholding, the Webbers were a respectable and long-standing yeoman family and should have been acceptable to the lambert Gorwyns. George did finally marry; by the time of the 1861 census he was an innkeeper in Landkey in North Devon with a wife and two small children. Mary was not chucked out by her family (which could well happen in those days to a daughter who produced an illegitimate child). But her son does not appear to have been very well treated by his relations. When he was 16, according to the census he was being employed as a “servant” (probably a farm labourer) by his uncle John Lambert Gorwyn of Coxland. He seems, however, to have been a person of considerable enterprise and not surprisingly left home. He joined the railways, which were at the time being extended into Devon and no doubt provided a good career opportunity for a young man of no background. He did well enough to become the stationmaster at Moretonhampstead, so he must have been pretty competent. Henry married a farmer’s daughter called Elizabeth Brock, against the will of her parents who no doubt disapproved of his illegitimacy and lowly status (at the time of the marriage he was a only a guard, and yeoman farmers were fiercely snobbish about marrying their daughters to anybody but another yeoman farmer). Elizabeth is said to have eloped, riding a horse into Exeter to marry her Lambert Gorwyn, so he must have been quite a character. Henry and Elizabeth had two sons, Henry W. B. Lambert Gorwyn (1857-1897), who does not appear to have left any descendants; and Albert John Lambert Gorwyn born in 1864 and still alive in 1948. Albert served in the Army in the First World War and was then a Major in the Territorial Army until 1921. He joined the Ministry of Pensions in Exeter and had a distinguished enough career to be one of the two members of the family included in Who’s Who in Devon published in 1934 (the other was George Lambert MP). Albert had several daughters and a son called Cecil Lambert Gorwyn who has a number of descendants alive today; they have, however, dropped the Lambert and are plain Gorwyn. To go back to Mary Lambert Gorwyn, she was finally married, in Exeter in 1846, to Thomas Pedrick, the brother of a maidservant of her parents. She had a daughter and two more sons, from whom there are a number of descendants. Although the last William Lambert Gorwyn to live at Bradleigh had no male heirs, two younger sons from earlier generations of the Bradleigh branch had a number of descendants, who divide into what I shall call the Medland and Hittisleigh Lambert Gorwyns (Table 8) and the Coxland Lambert Gorwyns (Table 9). As described above, the first William Gorwyn of Bradleigh (1780-1845) had three younger brothers, John, George and Joseph. Their father’s will demonstrates the problems that yeoman farmers had in providing for a number of sons, so as to leave them each with a livelihood. As he did not own enough farms to provide each son with his own, after leaving Spirelake to his eldest son William (ie the one who subsequently inherited Bradleigh), he bequeathed cash to his son Joseph; John got a farm called Hole; and George got a small farm in Hittisleigh called Medlake. As Medlake was a less valuable estate than the others, he directed William and John to make up the shortfall in George’s inheritance. How they did this is not clear, but the cash given to George Gorwyn (1784-1862) seems to have enabled him to purchase a leasehold of Medland, the grand manor house and farm in Cheriton Bishop that had previously been briefly owned by George Lambert Gorwyn of Spreyton and had been sold in the 1820s to a prosperous Exeter merchant called Seth Hyde. George married Jane Stone from Sandford and kept up the family tradition of large families by having six children. Like his cousins at Bradleigh and Coxland, George and his family gradually began adding Lambert to his name. He had three sons, called by the standard Lambert Gorwyn names of John, William and George. John Lambert Gorwyn of Greystone and Medlake (1813-after 1890), the eldest of the three sons of George, appears to have been the most dynamic. He left home at an early age and rented first the farm of Greystone in Drewsteignton from his remote cousin Richard Lambert Gorwyn, and then the 130 acre farm of Gorwyn, thus returning to the family’s probable ancient home, albeit on a leasehold basis. He remained there some 30 years. By 1871, however, he had given it up and moved to the much smaller Medlake in the small neighbouring village of Hittisleigh that he had presumably inherited from his father. By that time he was 58 and it may have been a retirement move. John married Ann Brely, the daughter of the miller at Fingle Mill (near Fingle Bridge). It was a shotgun wedding as their first child was born only about four months later. Their eldest son William Lambert Gorwyn (1844-1916) inherited Medlake and also took over the neighbouring farm of Davyland, also in Hittisleigh. He had several sons, one of whom, John Lambert-Gorwyn, was still farming at Davyland until the mid 1900s. The inside of the tiny parish church at Hittisleigh. There are Lambert Gorwyn graves in the graveyard. John and Ann’s second son, John Lambert Gorwyn of Fingle Mill (c1847-1892) was given employment at the mill of his mother’s family, the Brelys, and ended up by taking over the mill. Miller Brely was a confirmed atheist, who liked to shock his strict Methodist relations and proclaim his atheism by working the mill on Sundays (Sunday working being unheard of in those days in sabbatarian Devon - and indeed until the mid-20th century - except for essential farm work like milking and getting in the harvest before the weather broke)8. John seems to have been equally irreligious, as it is noteworthy that John’s daughters Eva and Ella were only baptised after his death, when they were well into their teens. Another story about a miller of Fingle - again it is not clear whether it was a Brely or a Lambert-Gorwyn - who liked a joke is that he painted one of the ducks on the mill-stream blue. As it paddled about in the river it caused quite a sensation amongst ornithologists who came to view it from far and wide9. The Mill burned down in 1893, shortly after John died. He left only daughters. The two younger brothers of John of Gorwyn of Greystone and Medlake, William Lambert Gorwyn (c. 1816-after 1881) and George Lambert Gorwyn (1826-1907), continued living with their father at Medland. William was a bachelor and seems to have been unsatisfactory in some way, as his father by-passed him and left the lease of Medland to George. George appears to have farmed at Medland at least until 1881, when in the census he is described as farming 234 acres. But by the time of the 1901 census George was living in retirement in a cottage at Dawlish. George had four daughters, so his branch of the family became extinct in the male line. But one of George’s daughters, Jane Lambert-Gorwyn, married John Pitts, a member of another prominent local farming family, and had 11 children. It was one of her sons, looking for extra land after the last War, who purchased his mother’s family’s ancestral home of Bradleigh, although he never lived there. The youngest son of the first William of Bradleigh was called John Lambert Gorwyn (1828-1893) and was the founder of the Coxland branch (Table 9). Under his father’s will, he came into Spirelake and all his father’s other property in Cheriton Bishop when he reached the age of 21 in 1849. He seems, however, to have acquired Coxland (a farm on the edge of the old village of Cheriton Bishop, overlooking the church) almost immediately, as by the time of the 1851 census he was already farming there at the tender age of 22, employing three labourers to farm 270 acres. He married Charlotte Lee and produced yet another huge family, 13 children, most of whom survived to adulthood and have descendants. Coxland is a large farmhouse with half a dozen big bedrooms. It dates from the 16th century (originally built of cob and thatch) with 17th century improvements and extensions added in the 19th century, perhaps to accommodate John and Charlotte’s huge family. Even so, the family must have been hard put to fit in, but they seem to have been happy enough. Because they had so many children, they decided that it was cheaper to employ a governess at 6d a day than to pay the 1p a day that the local school charged for each child, especially as the governess could also help milk the cows in the morning before starting on her lessons. An annex to the farmhouse was set aside as a schoolroom, and is to this day known as “the schoolhouse”. The family were famous in the village for the number of children – and for the number of pews in the church that they occupied on Sundays. The eldest son of Coxland, William Lambert Gorwyn (c.1857-1904), took over a farm called Halse in the nearby village of South Tawton in the 1890s. He then moved to Conways farm at Orsett in Essex. This was a time when the arable farming of South-East England was in crisis. Agricultural rents had plummeted as a result, and many stock farmers from both the West Country and Scotland were persuaded by these cheap rents to move to the South-East, where they hoped that their skill in dairy farming in particular would allow them to succeed where the south-eastern arable farmers had failed. Generally they were successful, and William remained at Conways until he died in 1917. After his death his family moved back to Devon, and his wife is buried with her father Joseph Haydon in Cheriton Bishop. They have no descendants alive in the male line. The next son, John Lambert Gorwyn (c.1865-1932), appears to have briefly taken over the farm at Coxland after his father’s death. But when he married, he joined the migration to the South-East, farming first in Kent and then in Sussex. He and his wife may have wanted a farm of their own rather than having to squeeze in with the rest of the family at Coxland, and it seems likely that he sold the share of the Coxland land that he inherited from his father to finance the purchase of a farm in Kent. His descendants are also now mainly in the South-East, with one branch in the United States. The third son, Albert Lambert-Gorwyn (1867-1931), also left Coxland, but stayed in Devon farming first at Halse and then at Sandford near Crediton. He has a number of descendants alive today, some still farming in Devon, but all are through the female line. The youngest son, Edward Lambert-Gorwyn, also went south-east, but to London, where he was working as a grocer’s assistant in 1901 and is thought subsequently to have run a boarding house. He married and had at least one daughter, but whether he has any living descendants is unknown, as his family lost touch with him. Coxland ended up in the hands of the second youngest son, Arthur Lambert-Gorwyn (1873-1952), and the only one to stay at home. He never married. When he died he left his estate to shooting friends and his housekeeper, and thus it passed out of the family, thus bringing to an end more than 600 years of Gorwyns continuously farming in Cheriton Bishop. He and his housekeeper seem to have been regarded as a couple of eccentrics. He was notoriously untidy both in his person (his boots were never properly laced) and in his farm. A neighbouring farmer’s wife10 remembers talking to him once across one of his gates. As they leant on the gate, it fell down. She immediately tried to pick it up and fix it back, but his reaction was “Let it lie, let it lie”. Another local farmer remembers that when a passer-by saw that some of the Coxland cows had got into a cornfield, he duly went up to the farmhouse to report on the fact, but was told by the housekeeper not to worry, as ‘they be Master’s cows and Master’s corn’. Arthur generously gave land in Cheriton Bishop for the building of a village hall (which opened in 1938). While it was being constructed, the roof of one of his barns started to leak and he asked the workman to come and do an urgent repair. They said that they were too busy on the village hall, which so infuriated him (especially as the leak ruined his corn) that he refused to set foot in the village hall for 20 years. 1 Deed of Conveyance of Spirelake in fee simple (freehold) for £220 by John Fulford and trustees to John Gorwyn, dated 26.11.1768 (in private hands). This mentions an earlier indenture of lease of 26.5.1740 whereby Francis Fulford leased Spirelake to John Gorwyn of Crediton for 99 years, at an annual rent of 7s plus one fat capon or 2s at Christmas, and a heriot of John Gorwyn’s best beast or £2 (a heriot was an extra payment due to the landlord when a lease fell in or passed to some other member of the tenant’s family). Spirelake fell into disrepair and was raised to the ground in the 20th century. 2 The papers in the National Archives (Gorwyn v. Hooke, C13/555/10) include a deposition by a lawyer in 1826 about John’s mental state; the case involved a dispute over whether a certain Samuel Hooke had repaid a loan of £920 made to him by John Gorwyn, mortgaged on the Hooke estate in Colebrooke. 3 His will is in the Devon Record Office ref: 1078/IRW/G468. 5 Major T. W. Venn: Crediton als Critton als Kirton and hereabouts. 7 It is just possible that the move was because of a fire at Bradleigh. Venn’s history of Crediton describes how, in a blaze at Bradleigh, “about 2 miles from Crediton”, particles of thatch came down in the streets where the unlucky farmer and his wife were at market. Help arrived too late, and even the trees in the orchard were burnt. Bradleigh is actually about 5 miles from Crediton, and it seems rather unlikely that particles of thatch would travel that far. Moreover, the present farmhouse at Bradleigh seems to be an ancient one and, although ruinous, shows no obvious signs of a 19th century fire. There is another Bradley or Bradleigh about two miles north-east of Crediton and it seems more likely that the fire was at that Bradley. 8 Story in the family of George Lambert MP, whose wife’s mother was related to the Brelys.